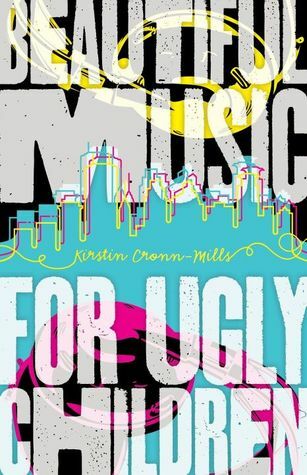 On to my second trans* book of the year: Beautiful Music for Ugly Children. Our MC is Gabe, a high school senior and total music nerd who has just landed his first radio show (at midnight, on local radio). He’s very close to his neighbor, John, an older man with an extremely impressive music collection. It’s John who gives Gabe his radio gig. Gabe is a trans guy, but he’s only out to a few people: his parents, his younger brother, and his BFF/crush, Paige. His parents aren’t exactly supportive—they consistently misgender him—but Gabe persists in taking steps toward fully coming out. He calls his show “Beautiful Music for Ugly Children,” and he begins introducing himself as “Gabe” on the radio. Soon he gains something of a cult following, a group of listeners who are oddly devoted to him. They call themselves the Ugly Children Brigade, or UCB, and they perform outlandish (but harmless) tasks around town at Gabe’s request. Gabe also receives weekly phone calls at the radio station from a flirtatious girl named Mara. When she asks him out on a date, Gabe accepts—but it doesn’t take Mara long to realize that Gabe is “Liz,” a classmate she recognizes from school. Of course, Mara panics and outs Gabe on the UCB Facebook page because it’s not an LGBTQ YA book unless someone gets outed. Two of Gabe’s followers feel “betrayed”; they believe that Gabe lied to them about who he is, and they begin to threaten him online and stalk him in real life. When Gabe and John finally meet the (friendly, accepting) members of the UCB in person, the stalkers show up to crash the party. There’s a scuffle. Gabe escapes injury, but John is bashed in the head with a baseball bat and taken to the hospital. His life hangs in the balance for a few chapters, as Gabe struggles with undeserved guilt. With YA fiction, you often have to suspend your disbelief a little bit. I’m all right with that, really! But some parts of this book were a little bit too unbelievable for me. Are there really that many teens listening to a local radio show (that doesn’t even play contemporary music!) that’s on once a week at midnight? And what’s more, they’re totally in love with Gabe after one show. Okay. The unbelievable plot points are not really what I want to discuss, though (although they did put a damper my reading experience). I want to talk about representation. Overall, I believe that the author, who is a cisgender woman, did a pretty good job writing a trans character. I like that Gabe is confident in who he is. I thought his parents reacted realistically to his coming out. I know some people think his parents’ change in attitude at the end was too quick, and I agree to an extent. I don’t think they’d have both come around at the same time. It would have been more believable if his dad hadn’t made any progress in accepting him by the end. I also liked that Gabe had to come out to Paige twice: once in eighth grade, and again their senior year. Sometimes that happens—especially if you come out young, to another young person who isn’t quite sure what to think or how to support you, or who doesn’t really understand the importance of what you’re trying to tell them. I did wonder about a couple choices the author made, though. For one, Gabe describes himself as “transsexual,” a term that usually refers to someone who has physically transitioned. Gabe would like to start hormone therapy, but he hasn’t yet. In my experience, “transsexual” is not often used these days, especially by young people. It’s sometimes considered an insensitive or offensive term. Gabe also used the term “bio guy” to talk about cisgender men. This book was written in 2012–perhaps that was before the term “cisgender” was widely used? It was also incredibly weird that John called him a “triangle.” I did appreciate the long author’s note at the back of the book; the author acknowledged that terms used to describe trans* identities shift and evolve rapidly. I was also disappointed by the violence in the book. The supporting characters were a bit two-dimensional: most of them either accepted Gabe, or they vehemently (and often violently) rejected him. It felt overdone, and too simple. Overall, I couldn’t get into this one. I was distracted by the endless music details, and I felt the plot employed too many tropes. I would agree that transsexual is rarely used by people I know under 40. In the foster/adoption world, “bio” is sometimes used to refer to a child’s birth family/family of origin. I’ve never heard it used that way by my trans friends – if needed some say biological male, but usually cis is the accepted term. There aren’t many trans books I’ve read that I’d also recommend, but if you haven’t read Janet Mock’s Redefining Realness yet, it’s a must-read memoir. As Nature Made Him is one I usually recommend to people who don’t accept transitions, but is just generally an interesting read too. And if you ever read MG fiction, George is an elementary school novel. The others I’d recommend don’t have the trans character/gender aspect as a main part of the book, it’s more of a sideline. I’ve been meaning to read Redefining Realness for a while now. I’ve read George, and I loved it. I hadn’t heard of As Nature Made Him. I’ll have to check it out. Thanks for the recommendation!